New products include the 3Flex™ Surface Characterization Analyzer and Particluate Systems’ NanoPlus DLS Nano Particle Size and Zeta Potential Analyzer. The 3Flex is a versatile high-throughput surface area, mesopore and micropore system. A single 3Flex with its three configurable analysis stations eliminates costly investment in multiple instruments and additional bench space. Heated vapor analysis capability is standard and an extended-range vapor option is available. The NanoPlus is a unique instrument that utilizes photon correlation spectroscopy and electrophoretic light scattering techniques to determine particle size and zeta potential. 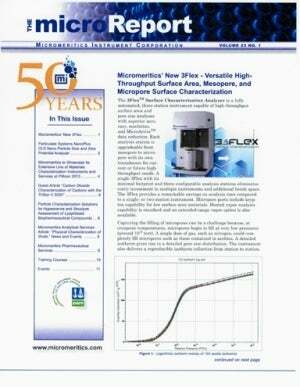 Micromeritics will showcase these instruments, as well as many other products, at Pittcon 2013 in Philadelphia, March 17 – 21. Application articles include: ‘Carbon Dioxide Characterization of Carbons with the TriStar® II 3020’, ‘Particle Characterization Solutions for the Appearance and Structure Assessment of Lyophilized Biopharmaceutical Compounds’, and ‘Physical Characterization of Shale’. The new microReport also includes a list of upcoming scheduled events as well as instrument and analytical technique courses offered by Micromeritics’ Learning Center.